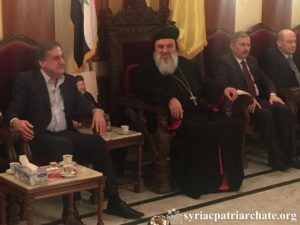 On December 22, 2018, His Holiness Patriarch Mor Ignatius Aphrem II received at the Diocesan Headquarters in al-Sulaymaniyye their Excellencies: Mufti of Aleppo Sheikh Mahmoud Akkam, Governor of Aleppo Hussein Diab, as well as the Director of Endowments Rami Obeid, visited His Holiness to offer their congratulatory wishes for Christmas and the New Year. 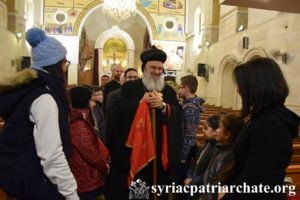 On December 22, 2018, His Holiness Patriarch Mor Ignatius Aphrem II arrived to Aleppo on a short visit to the Archdiocese of Aleppo. 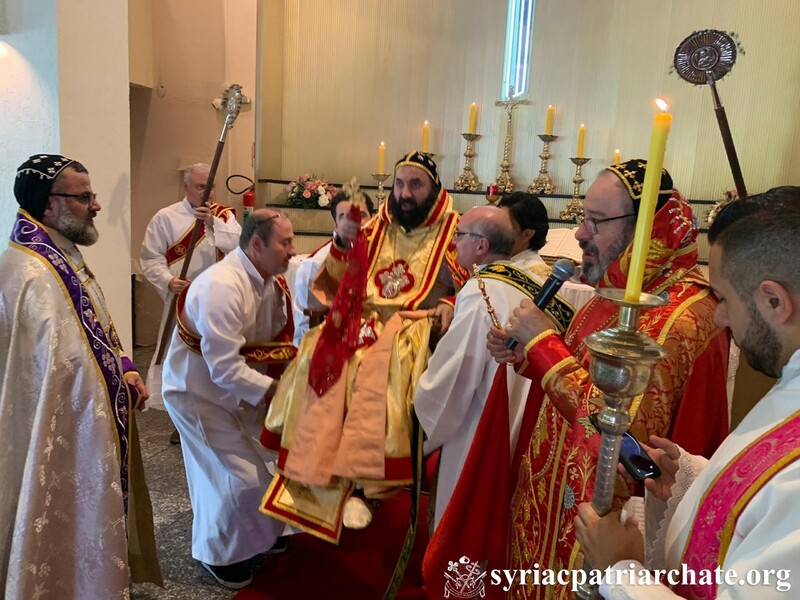 He was accompanied by His Eminence Mor Timotheos Matta Al-Khoury. His Holiness was welcomed by Very Rev. Raban Boutros Kassis, Patriarchal Delegate of the Archdiocese of Aleppo and Environs, and the clergy of Aleppo, along with a crowd of the faithful. His Holiness entered St. Aphrem Cathedral in al-Sulaymaniyye neighborhood, where he raised prayer. 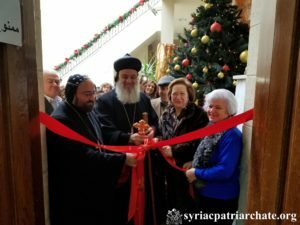 Then, His Holiness gave a word in which he greeted the faithful of the Archdiocese of Aleppo on the occasion of Christmas. He assured that our joy remains lacking the presence of His Eminence Mor Gregorius Youhanna Ibrahim, abducted Archbishop of Aleppo. He prayed for his release along with Archbishop Boulos Yaziji, priests, and all who are abducted. On December 21, 2018, His Holiness Patriarch Mor Ignatius Aphrem II attended a Christmas meditation night entitled “Christmas: Light for the World”, organized by all the youth organizations in the Patriarchal Archdiocese of Damascus. 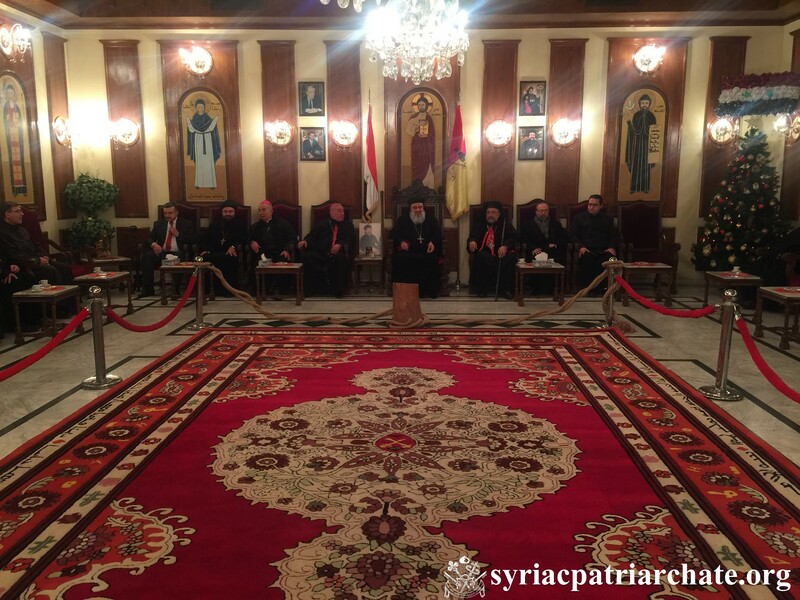 His Holiness Presided over Ramsho (evening) Prayer in St. Georges Cathedral, in the presence of His Eminence Mor Timotheos Matta Al-Khoury, Patriarchal Vicar in the Patriarchal Archdiocese of Damascus, priests and monks of the patriarchate, and a large crowd of faithful. In his sermon, His Holiness meditated on the shepherds, and how the Good News was preached first to the simple and meek rather than the philosophers and rich. He said that the shepherds went searching with fear for the Baby born; however, when they found Him, they were comforted, thus they went preaching to all whom they met what they have seen. His Holiness also spoke about the message of peace that the angels brought to the earth. 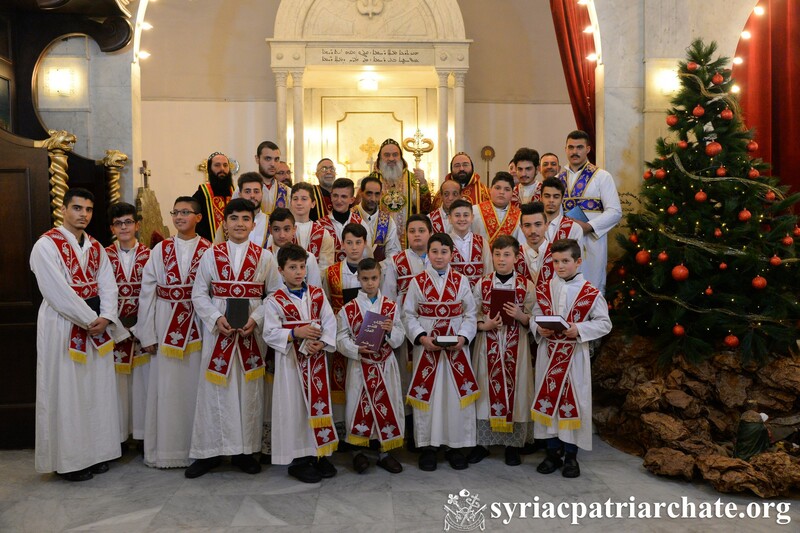 He thanked the Lord for the security and safety which are back to Syria, and expressed his gladness to see Christmas decorations and celebrations all over Syria once again. Nonetheless, His Holiness urged the faithful to keep in their mind and heart that Jesus is the reason of all these celebrations. After the prayer, a Christmas meditation play was presented by the youth, in which they raised prayer altogether. 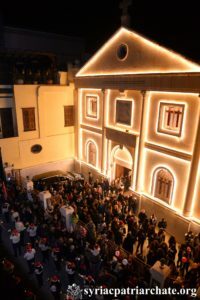 Then, His Holiness and all the crowds of people moved to Sayfo garden where he lit the Christmas decoration. 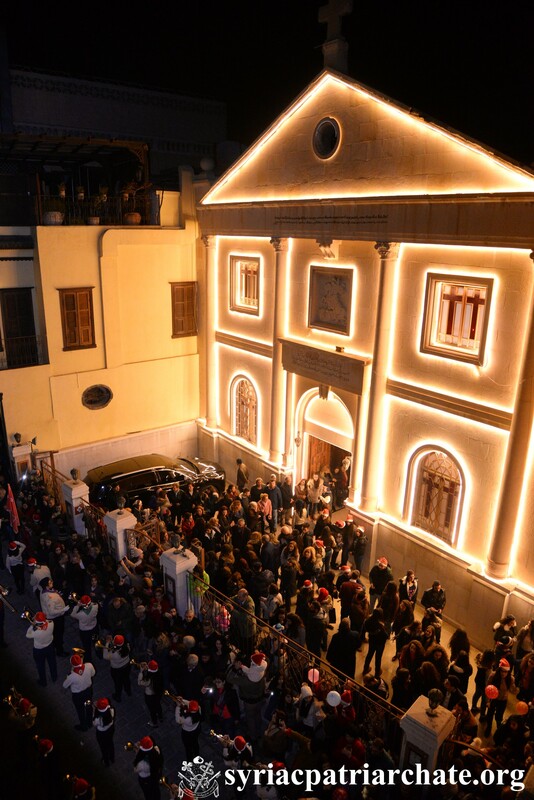 A Christmas celebration then took place in which several Christmas Chants, as well as other activities were presented. 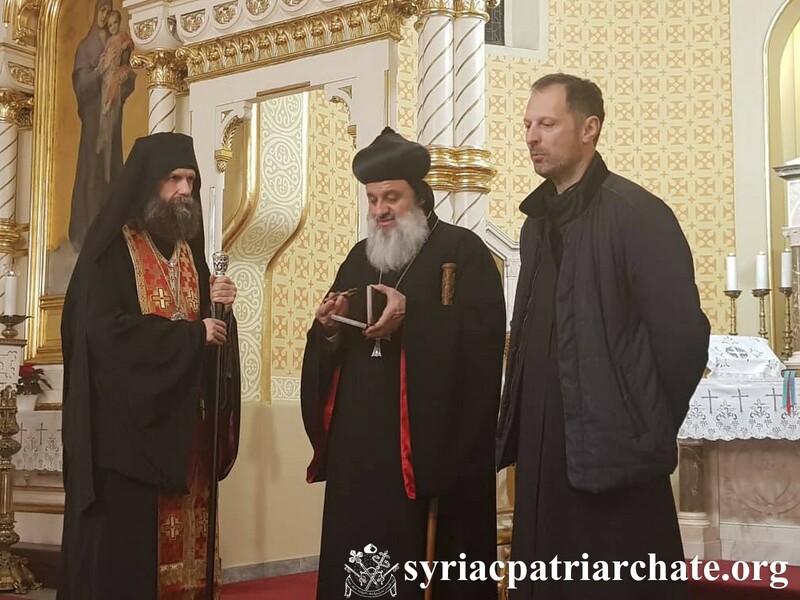 On December 20, 2018, His Holiness Patriarch Mor Ignatius Aphrem II participated in the Christmas Spiritual Retreat for the Clergy of Damascus, held at the Greek Catholic Patriarchate of Antioch and All the East. 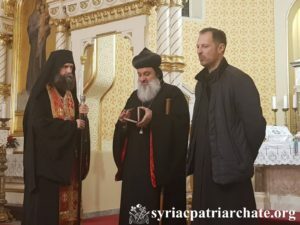 His Beatitude Joseph Absi, Greek-Melkite Catholic Patriarch of Antioch and all the East, Alexandria, and Jerusalem, hosted the spiritual retreat at the Lady of Dormition Cathedral in the Patriarchate. His Eminence Mor Timotheos Matta Al-Khoury, Pratriarchal Vicar in the Patriarchal Archdiocese of Damascus, as well as a number of the Reverend priests, monks, nuns and deacons of ous Syriac Orthodox Patriarchate and of Mor Aphrem, Mor Baradeus and Holy Cross Monasteries, also participated in the retreat. 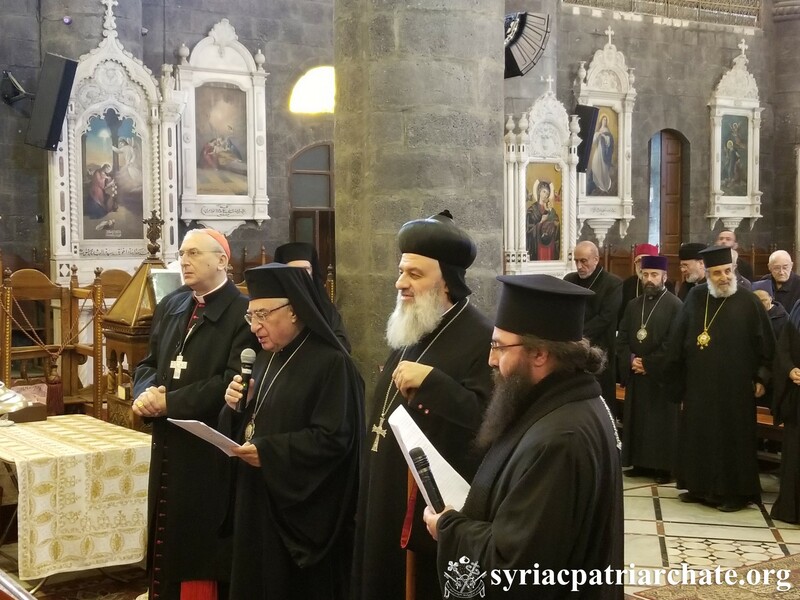 His Eminence Cardinal Mario Zenari, Apostolic Nuncio in Damascus, along with the Archbishops and clergy of Damascus also attended the retreat. During the retreat, His Grace Bishop Nicolas Antipa gave a meditation about the new perspective on life that our Lord gave us being born in a manger. In his word, His Holiness Patriarch Mor Ignatius Aphrem II emphasized that our Lord Jesus is the greatest gift of the Heavenly Father to humanity. He is the only reason for Christmas. His Holiness added that decorations and celebrations should not grab our attention away from the real meaning of Christmas. He considered that our Lord is in control and He is the Governor of all the world even when He was born a Babe in a manger. His Holiness continued that we should worry or be afraid, since, amid all the destruction and wars that surround us, our Lord is the Almighty God, He is our Loving God who will never forsake us. His Holiness concluded with a prayer for the Prince of Peace to spread His peace throughout the globe, especially in the Middle East. During the retreat, His Eminence Cardinal Zenari, as well as a number of their Eminences and Excellencies contributed speaking about the role of the Church as an outgoing Church; they also spoke about Virgin Mary as the new Eve, the decorations which are good sign that peace is back to Syria, the piece of wood of the manger and that of the cross, Emanuel – God with us, casting all fears away, and Christmas eve as a heart-transforming eve. His Beatitude Patriarch Absi then spoke welcoming all the clergy present. He also invited them to keep their eyes directed towards the Baby born, especially as clergy. Several meditations and chants from the various liturgies were also presented during the retreat. On December 19, 2018, His Holiness Patriarch Mor Ignatius Aphrem II celebrated the Holy Qurobo at St. Georges Patriarchal Cathedral in Bab Touma, Damascus. In his sermon, His Holiness spoke about getting ready for Christmas. He said that this ordination today is a gift offered to the Child of the manger, and a gift to the new qoruye and their families. He also instructed the qoruye to lead a life of holiness and live by God’s fear and following his will. He prayed that some of them will one day dedicate their lives for the service of the Church of God and His people. On December 16, 2018, His Holiness Patriarch Mor Ignatius Aphrem II inaugurated a Christmas Charity Bazaar organized by the women’s group of the Patriarchal Archdiocese of Damascus, at Sayfo hall in the Patriarchate Headquarters in Bab Touma, Damascus. The bazaar continues till Tuesday evening (Dec 18), and aims at fundraising for charity works organized by the women’s group. On December 14, 2018, His Holiness Patriarch Mor Ignatius Aphrem II attended an advent meditation held in Budapest for the holders of scholarships from the State Secretariat for the aid of persecuted Christians. His Holiness was accompanied by His Eminence Mor Timotheos Matta Al-Khoury, Patriarchal Vicar in the Patriarchal Archdiocese of Damascus. 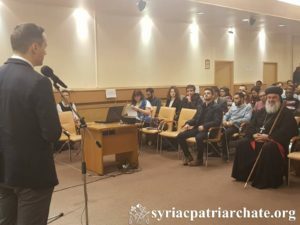 The event was attended by His Excellency Mr. Tristan Azbej, State Secretary for the Aid of Persecuted Christians, and His Excellency former Minister of Human Capacities Mr. Zoltan Balog. His Excellency Minister Azbej spoke about the importance of helping Christians in the Middle East. He also commended the huge efforts of His Holiness to support all Christians and all those affected by the crises in the Middle East. His Holiness spoke about the role of education in promoting humanity, emphasizing that the support of the government of Hungary in educating young Christians is very important for the reconstruction of our countries. He expressed his happiness to meet the students who have received scholarships from the Hungarian government. He hoped for the continuation of the cooperation with the Hungarian people and government in support of all the persecuted Christians in the world. The students present at the meditation recited hymns from different traditions and in various languages. On December 13, 2018, His Holiness Patriarch Mor Ignatius Aphrem II attended the evening prayer at the Greek Catholic church in Budapest. 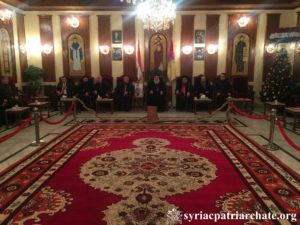 His Holiness was accompanied by His Eminence Mor Timotheos Matta Al-Khoury, Patriarchal Vicar of the Patriarchal Archdiocese of Damascus. In his spiritual message, His Holiness spoke about martyrdom and the persecution of Christians, especially in the cradle of Christianity. He also spoke about the true message of Christmas, which is love and mercy, indicating that the incarnation of our Lord is a message of peace for humanity. At the end of his message, His Holiness thanked the churches in Hungary for their support for the suffering people in Syria and Iraq. At the conclusion of the prayer, His Holiness presented His Excellency Metropolitan Fulop Kocsis with a cross as a token of appreciation for his efforts in helping the suffering Christians in the Middle East.